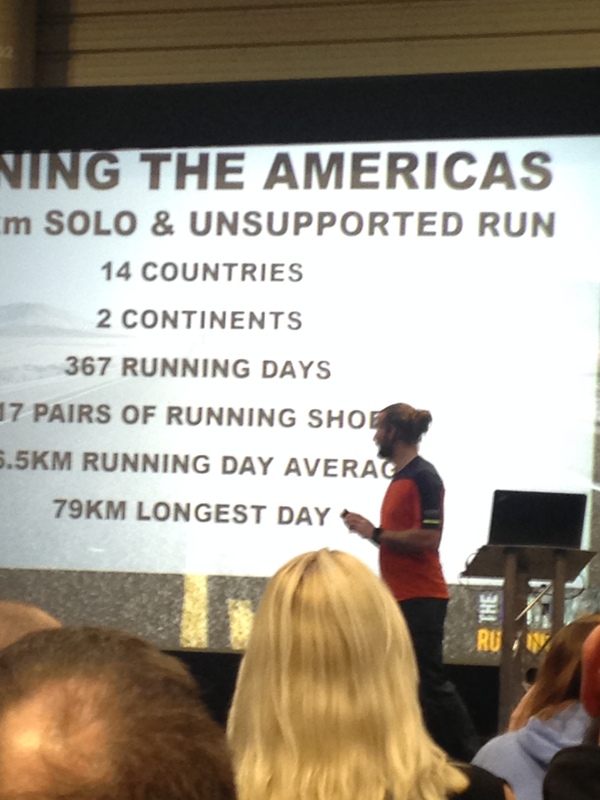 Following my last post, I am now ready to share with you what happened on the 2nd day of the National Running Show in Birmingham. The show started at 9:30am and the first speech was by Sean Conway who is currently the only person in history who has completed the Great British Triathlon which consists of running, swimming and cycling the length of Britain. The swim was considered impossible and had never been attempted. Unfortunately I had missed this speech as I was having breakfast at the same time. I joined the show and the first thing I realised was that it didn’t seem as busy as the day before however that is to be expected. The next speech was by Jamie Ramsey and I joined half way through. Jamie ran the entire length of the Americas starting at Vancouver in Canada and ending in Buenos Aires in Argentina. I was completely blown away and inspired by what Jamie had achieved and I was just totally mesmerised. After listening to Jamie speech, I was so eager and excited to listen to rest of the speeches during the day, anticipating more sources of inspiration. The picture below shows the scale of Jamie’s achievements. Next up was Anna Mcnuff and Anna’s positive personality shone throughout her speech. Anna ran the entire length of New Zealand whilst was around 2,000 miles. Anna spoke of her positive and negative experiences but her spirit and courage was amazing. Elise Downing was next on stage and I was really looking forward to hearing her speech. I have followed her on Twitter since last year but I didn’t know that she was speaking so it was a nice surprise. Elise ran a lap of the British Coast starting on the 1st November 2016 which was around 5,000 miles and was the youngest person and the only female to complete the challenge. I was amazed by how someone so young achieved such a historic accomplishment. Next there was a question and answer session consisting of Russell Smith and Susie Chan (both chairs), Sean, Ira Rainey, Anna, Elise and Jenny Tough. A lot of interesting questions were asked including how did they save the money to do these expeditions. I found this question in particular quite interesting as you realise these people were ordinary people who had ordinary jobs but decided they wanted to live their life a certain way and they saved up the money needed to undertake their treks. After lunch there was a speech by Lisa Jackson who has ran 105 marathons and finished last in 25 of them. Lisa talked about how it is ok to finish last and I totally agree with her. The reality is the person who finishes last isn’t really last as they are still in front of everyone who hadn’t even attempted to run. There is a lot of pressure on runners to run well and get a certain time so it was refreshing to hear Lisa’s speech. The next speeches were by Ira Rainey and Anita Bean but I was now having a browse of the stalls again looking for things to buy. There was some amazing things there including foam rolling which I ended up trying. Found it really painful and don’t think foam rolling is for me. Next up was Danny Bent who was voted in the top 100 of the happiest people in the UK and one of the 50 most inspirational people in London. I could tell this was the case just by listening to him as he had a happy persona about him. Next up was Jenny Tough and I believe that Jenny is Tough by name and tough by nature. Jenny has an ambition to run across a mountain range on every continent. She has ran across a mountain range in Kyrgyzstan which took 23 days. Jenny’s self-belief was evident as she was constantly told at the start of her trip that it wasn’t possible but she proved them wrong and I think that was the biggest thing I learnt from her talk. The next speech was by Barefoot Aleks Kashefi.I missed this speech but his achievements include running Land’s End to John O’Groats barefoot in 2015 and becoming the first person to have run the entire length of the European continent in 2017, having decided to start his 6 months long run from deep in the Arctic Circle, at the end of summer, self-supported and in his trusty Luna sandals. The penultimate speech was from Dan Keeley titled from Rome to Home. I was gutted to miss this speech as it combined two of my passions (mental health and running). In 2012, after 6 months of not looking after himself, Dan experienced a full-scale manic episode in Italy which resulted with him preaching from the central lane of a major motorway at rush hour. He believed he was ‘the chosen one’. What followed was time spent in psychiatric wards, a diagnoses of Bipolar Disorder and 6 months of crippling depression which had him wanting to take his own life. Dan decided to take on this challenge to share his story and he raised around £17,000 for charity. All this and countless more people inspired and motivated to make a real positive change in their lives and others’ forever. To briefly summarise, this was a fantastic event and an amazing weekend. I do however feel the speeches today in particular were incredible. One thing that all the speakers had in common is that they all came across multiple barriers but their love for running and the outdoors outshone everything. It goes to show that the impossible is possible if you put your mind to it. Sorry this is a really long post and thank you so much if you have got to this point. Wow, there really were some incredibly impressive speakers at this show! Running is something that I’ve started doing this year, it was my new year resolution and I’m still going! I’m sure that listening to these amazing people tell of their achievements was so motivating for you! Wow what inspirational people. You must’ve had a great time. It’s amazing what some people can overcome. You seemed to have had a good time too which was the main thing!! Those speakers seem really motivating. I know that with running endurance and motivation are key, so it must have been great to have been in a room filled with people with such mindsets. Thanks for sharing! Wow that was a great read. They are truly inspirational. I am now all pumped up to write my blog. That sounds like a big weekend with so many inspiring speakers. Sounded interesting and thanks for the trigger warning. Wow this seemed to have been quite an inspirational day. I was in awe reading about Ben Smiths achievements, everyones was amazing. I’m slowly getting back into running and this has definitely sparked that flame to keep going. Thank you for sharing! Really interesting to read. Sounds like you had a great time.